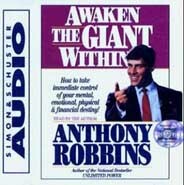 Anthony Robbins already has unlocked the personal power inside millions of people worldwide. He unleashes the sleeping giant that lies within all of us - teaching us to harness our untapped abilities, talents and skills. The ultimate program for improving the quality of every aspect of your life - personal or business, physical or emotional - "Awaken the Giant Within" gives you the tools you need to immediately become master of your own fate.